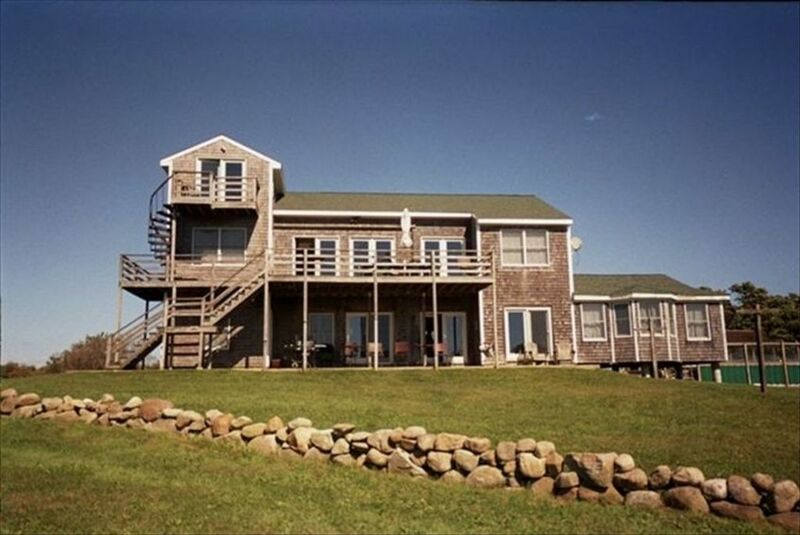 The house sits on a knoll overlooking Block Island sound, Montauk Point and New Harbor. The walking beach is 300 feet away and the sandy beach is 1/2 mile away. We completed a total renovation in 2000. All the floors are marble and 3 full baths are tile. There are 2 outside showers plus a 1/2 bath in the laundry room. Two nicely equipped kitchens with butcher block counters offer everything including dishwashers and garbage disposals. Three outside grills are on the patios and deck. There are 6 bedrooms, including 2 king, 2 queen, and 6 single beds. There are also 2 futons. You may also rent out 1/2 of this facility. Everything is freshly painted, maintained and cleaned. All linens are included but must be clean upon your departure. We recommend you bring your own linens.. Two satellite TV's and DVD players and stereos on each floor with either blue tooth or cable to connect phone or ipod. There are 2 hot water heaters and great water pressure. Basically we have thought of everything. Including a Jacuzzi and, BEST OF ALL, a full sized TIKI BAR! You can't go wrong at 'The Crew's Hideout'. RENTAL IS ON WEEKLY BASIS SATURDAY to SATURDAY or SUNDAY TO SUNDAY We will also rent for the month or summer. This property has been in our family since 1995. We all love traveling here and usually enjoy two family weeks each year. The kids all love it and its a great vacation tradition. Block Island is a special place which has not been commercialized. Its like traveling in time. Secluded from the outside world which allows you to truly decompress and relax. A short drive to the most popular sun bathing locations on the island. They are a short bike ride away or a decent walk depending on your preference. This beach has the most beautiful sunsets and is a short walk from the house. It is a walking beach, rocky terrain but very nice. Sweeping views of the Ocean from most areas of the house. We have linens, but advise you to bring your own. All lines must be clean at your departure or their will be surcharges. We have towels but advise you to bring your own. All linens must be cleaned prior to departure. Breakfast bar upstairs and downstairs, plus tables. Also, outdoor seating. Our family has spent the last two summers at Crew’s Hideout which has a great location and gorgeous views of the sunset! Although the Tiki Bar and patio is a fun spot to hang out, you just can’t beat the views, especially on the second floor, sipping cocktails, eating appetizers, cooking and eating dinner, watching the sun go down….It is a short walk to West Beach for early morning walks or late afternoon walks along the rocky shore to the North Lighthouse and one mile to Mansion Beach. It is an added plus to have AC on those muggy days to keep bread and fresh fruit from molding. Great place!